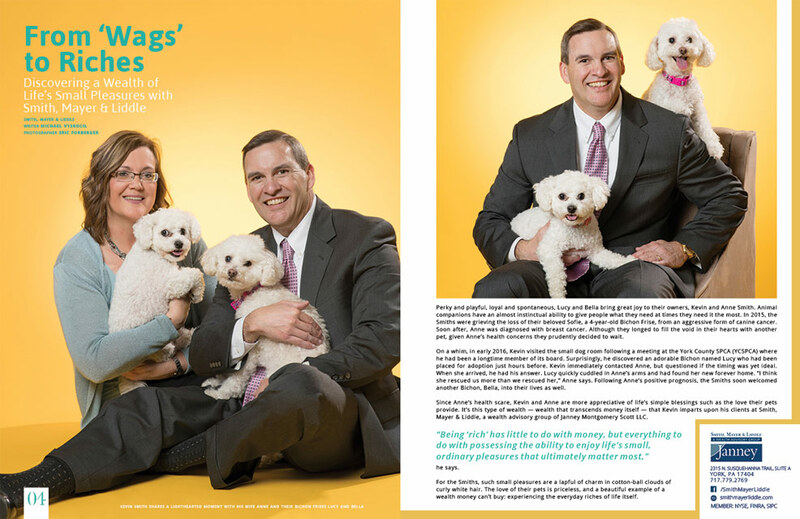 Perky and playful, loyal and spontaneous, Lucy and Bella bring great joy to their owners, Kevin and Anne Smith. Animal companions have an almost instinctual ability to give people what they need at times they need it the most. In 2015, the Smiths were grieving the loss of their beloved Sofie, a 4-year-old Bichon Frise, from an aggressive form of canine cancer. Soon after, Anne was diagnosed with breast cancer. Although they longed to fill the void in their hearts with another pet, given Anne’s health concerns they prudently decided to wait. 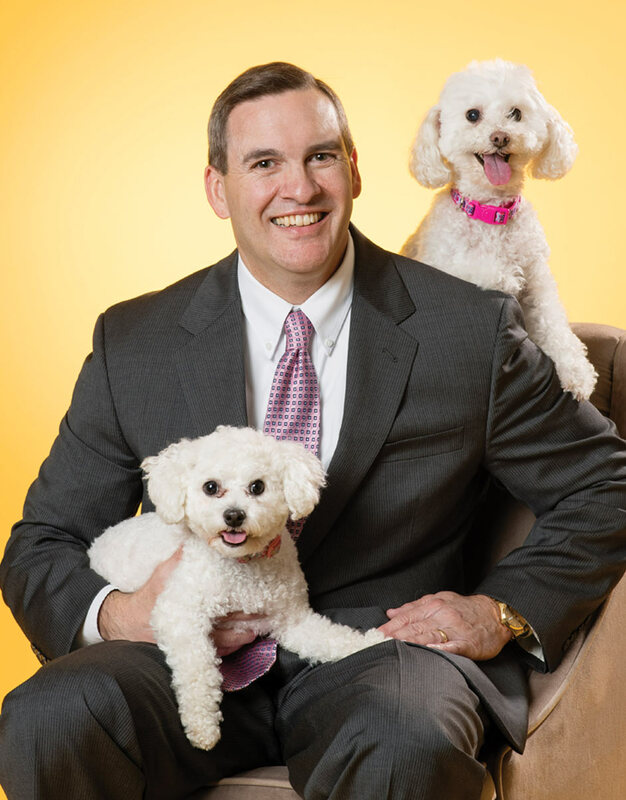 On a whim, in early 2016, Kevin visited the small dog room following a meeting at the York County SPCA (YCSPCA) where he had been a longtime member of its board. Surprisingly, he discovered an adorable Bichon named Lucy who had been placed for adoption just hours before. Kevin immediately contacted Anne, but questioned if the timing was yet ideal. When she arrived, he had his answer. Lucy quickly cuddled in Anne’s arms and had found her new forever home. “I think she rescued us more than we rescued her,” Anne says. 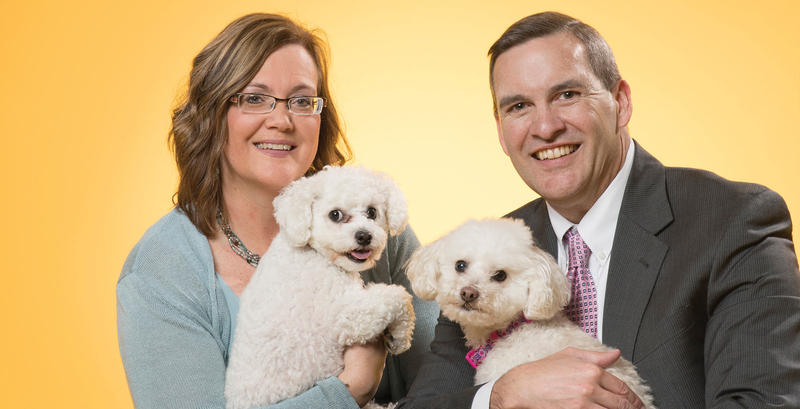 Following Anne’s positive prognosis, the Smiths soon welcomed another Bichon, Bella, into their lives as well. Since Anne’s health scare, Kevin and Anne are more appreciative of life’s simple blessings such as the love their pets provide. It’s this type of wealth — wealth that transcends money itself — that Kevin imparts upon his clients at Smith, Mayer & Liddle, a wealth advisory group of Janney Montgomery Scott LLC. For the Smiths, such small pleasures are a lapful of charm in cotton-ball clouds of curly white hair. The love of their pets is priceless, and a beautiful example of a wealth money can’t buy: experiencing the everyday riches of life itself.